The Miniature Schnauzer breed was developed in Germany during the late 19th century. The breed was formed by crossing a Standard Schnauzer with the Affenpinscher. The Miniature Schnauzer was created to serve on German farms as a rat hunter but was also used in conjunction with larger breeds such as the German shepherd to guard flocks. This breed has excellent hearing and was able to detect threats and sound a warning long before their larger shepherd cousins. The Miniature Schnauzer breed was differentiated from the Standard Schnauzer in Germany by 1899 but was not recognized as a different breed by the AKC until 1933 when they created separate categories for Miniature and Standard breeds. The Miniature Schnauzer breed has a distinct face that is hard to forget, and even harder not to love. “Schnauzer” in German means “muzzle” or “snout”, and was used commonly to refer to a mustache. The Miniature Schnauzer has both characteristics indicated by their name; they have a long, rectangular snout, and long facial hair that resembles a mustache. Their coat is short and wiry, which was also helpful for their work chasing rats on the ground. Miniature Schnauzer’s weigh between 11-20 lbs and stand between 12-14” tall. The Miniature Schnauzer is an extremely intelligent breed that has a more affable and pleasant temperament than the Standard and Giant Schnauzer. They are known to have a playful, inquisitive, and affectionate personality and make great family dogs. They are also very alert and are known to pick up sounds that many other breeds may not hear, allowing them to warn their family if they sense danger. Some are also known to bark excessively, so training this behavior from the time they are a puppy is a must for this breed. The Miniature Schnauzer is regarded by trainers and owners alike as an easy and pleasurable breed to train. They are exceedingly intelligent and can grasp new commands quickly while retaining trained commands over time. They are responsive to their owner’s demands and love to please. While the Miniature Schnauzer can be stubborn at times, they are overall a very agreeable breed to train. The Miniature Schnauzer has medium energy for a small breed, so daily exercise is a must. A moderate walk or extended play session is recommended to keep your Schnauzer content, well behaved, and in good health. The Miniature Schnauzer is a playful breed, so incorporating training and play into daily exercise is a great way to reinforce training while building bonds of companionship. A healthy small sized breed, a Miniature Schnauzer lifespan ranges between 12-14 years on average. While they do have some health issues that they are predisposed towards, the Miniature Schnauzer life expectancy is usually long. Since their introduction into the United States, the Miniature Schnauzer has been an exceptionally popular breed. At one point they were the third most popular breed with the AKC. They are now ranked as the 17th most popular AKC breed. By all accounts, their popularity continues to rise due to their playful, affectionate nature, innate intelligence, and charming looks. Miniature Schnauzers do not have any breed-specific feeding requirements. As with all dog breeds, make sure that you are feeding them high-quality food. Look for food with high-quality proteins, vegetables, and fats. Avoid foods that use grain fillers such as soy, corn, and wheat, as these are difficult for dogs to digest and can lead to allergies. You should expect to feed your Miniature Schnauzer about ¾ to 1 cup of dry food a day, split into two even meals. The Miniature Schnauzer is a non-shedding breed, and so must be brushed regularly. The Miniature Schnauzer has a wiry top coat and a fluffy undercoat. In order to avoid matting and to maintain the overall health of the coat, owners should expect to brush their Miniature Schnauzer at least twice a week. Regular professional grooming every 5-8 weeks is also recommended. Many Miniature Schnauzer owners have their dog’s coat kept trimmed close to the body, which accentuates their droopy mustache. For optimal Miniature Schnauzer health, owners should clean their ears regularly, checking for buildup of wax or strong odor that indicates an ear problem caused by infection. Owners should also trim their nails every couple of weeks. Are Miniature Schnauzers Good With Children? Miniature Schnauzers are great with kids, which is part of the reason they have seen such a drastic rise in popularity over the last century. They are affectionate and playful with children and make great companions and family dogs. Very young children should be supervised with Miniature Schnauzers. They can be inadvertently injured due to their small size. Urolithiasis: Urolithiasis is a health problem characterized by the formation of stones in the urine. Often referred to as urinary stones or kidney stones, this disease is extremely painful and can be life threatening. The exact cause of this disease is unknown in dogs, however, it is known that stones, known as uroliths, or crystals form from an excess of minerals in the urine. The crystals or stones can form at any point in the urinary tract, including the kidneys, bladder, and urethra. Commons signs of urinary stones are difficulty urinating, blood in the urine, dribbling urine, and pain when urinating. Extreme cases of urolithiasis result in a complete blockage of the urinary tract, which is a life-threatening condition that must be treated through surgery. Less severe cases are often treated with a special diet that contains limited amounts of specific minerals commonly found in urinary stones and crystals. Progressive Retinal Atrophy (PRA): PRA is a health issue that is caused by the degeneration of photoreceptor cells in the eyes. Degeneration of the photoreceptor cells results in a diminished capacity of the eye to perceive light. In general, the first sign that your Miniature Schnauzer is suffering from PRA will be an inability to discern objects in low or dim light. As PRA progresses it will result in full loss of vision in both eyes. PRA is a hereditary condition, so inquire with your breeder as to whether their line has any history of PRA or other eye diseases. Cataracts: Cataracts are a condition that affects the lens of your dog’s eyes. Cataracts will be visibly noticeable as they form on the lens of the eye, resulting in a cloudy or occluded appearance. At early stages, these growths will not obscure vision, however as they progress they will lead to diminished vision and even full blindness. Cataracts can appear at any time during your dog’s life, from birth all the way to old age. In Miniature Schnauzers, cataracts appear more frequently in juveniles. Owners should make examining their Miniature Schnauzer’s eyes an important part of any grooming session. Cataracts are a hereditary disease, so be sure to consult with your breeder to find out if cataracts have appeared in their lines at any point in the past. Entropian Eyelids: Entropian eyelids are a Miniature Schnauzer eye problem causing the eyelid rolls inward, toward the eyeball. This causes the hair located on the outside of the eyelid to directly contact the surface of the eyeball, or cornea, which results in tearing or scarring over time. Entropian eyelids are extremely painful and should be treated immediately to avoid any permanent damage to the eye. Squinting, shutting of the eye, and excessive tear formation are all symptoms of entropian eyelids. This condition is a hereditary condition that is known to affect Miniature Schnauzers more often than some other breeds, so be sure to check with your breeder to inquire whether any dogs in their line have suffered from this condition in the past. Schnauzer Comedo Syndrome: Also known as Schnauzer bumps or Schnauzer comedo syndrome, Schnauzer comedo syndrome is a skin condition that exclusively affects Miniature Schnauzers. With Schnauzer comedo syndrome, your dog will develop bumps along their back that resemble pimples or blackheads. These bumps can be accompanied by loss of hair in the affected areas. In general, this condition is not harmful to your dog’s health, but it can be uncomfortable depending on severity. This Miniature Schnauzer skin problem is most commonly treated with special shampoo or topical ointments. von Willebrand’s disease: Von Willebrand’s disease is characterized by a reduced amount of an antigen in the blood that is responsible for clotting. This most often results in a decreased ability to form blood clots on wounds, which will cause excessive bleeding. In general, von Willebrand’s disease is not life threatening, and many Miniature Schnauzers that suffer from it will live full and happy lives. After a play session, be sure to check your Schnauzer for any signs of small cuts or wounds that continue to bleed, as these may indicate von Willebrand’s disease. If you suspect your Miniature Schnauzer is suffering from von Willebrand’s disease be sure to consult with your veterinarian and closely monitor their play sessions. Pancreatitis: Pancreatitis is a potentially life-threatening condition wherein the pancreas becomes inflamed and swollen. The pancreas is an organ located between the stomach and small intestines that are responsible for releasing enzymes that help dogs digest and absorb fats. The causes of pancreatitis are not well known, but it is theorized that genetics, as well as frequent access to high-fat human foods or even high-fat dog foods, play a role. Pancreatitis can either be acute, with a sudden onset, or chronic, a condition that continually affects the dog over time. Typical symptoms of pancreatitis are abdominal pain, vomiting, diarrhea, and fever, with more extreme cases causing difficulty to breathe and heart arrhythmia. For reasons that are not completely known, Miniature Schnauzers are disproportionately affected by pancreatitis. As a Miniature Schnauzer owner, it is important to be mindful of the symptoms of pancreatitis and seek a veterinarian immediately if you suspect your dog is suffering from it. Hypothyroidism: Hypothyroidism is a condition where the thyroid of a dog secretes too small an amount of the hormone thyroxine. Thyroxine is responsible for regulating the metabolism. When insufficient amounts of thyroxine are present in the blood, dogs will typically experience weight gain or obesity, hair loss, and a sluggish behavior. Ear infections and altered heart rates are also a common effect of hypothyroidism. While hypothyroidism can be extremely detrimental to your dog’s health if left untreated, it is relatively easy to diagnose and treat. Typically, treatment requires administering a medication that supplements the natural levels of thyroxine in the blood stream with an engineered hormone. Administration of medication is usually accompanied by changes in diet, and treatment continues throughout the life of your dog. After much searching we found Canna-pet and I could not be happier! When we leave it is no longer heart breaking listening to her cry, instead she waits for her treats by her bed and when we come home no more howling, just a friendly greeting! 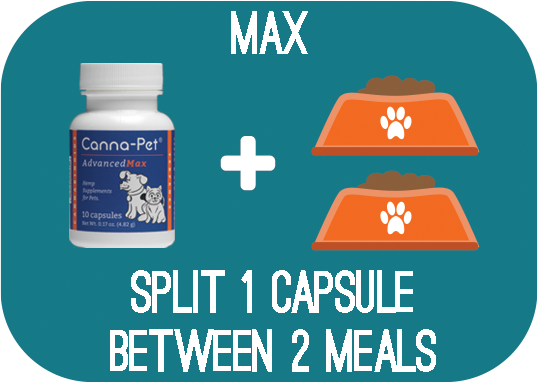 (I) supplemented with Canna-Pet dog treats and within a few days, she was back to her old happy, playful self. I am so much happier here and don’t have the shakes so much anymore. He was able to put weight on his leg and was as good as a 15 year old mini schnauzer could be! We will never be without our Maple Bacon treats!!!!!!!!! !